Shohei Otani closing in on MLB, could New York be the destination? 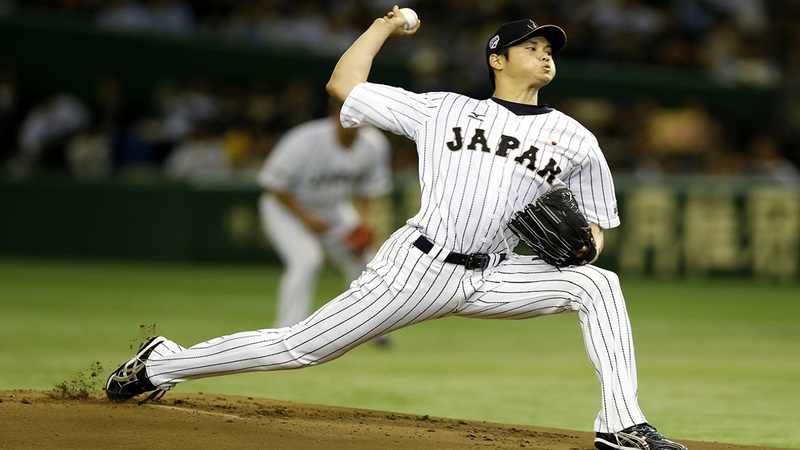 NEW YORK (WABC) -- There are no lights brighter, and no stage larger than the ones you'll find in the Big Apple, and they may be just enough to attract Japan's latest baseball superstar, Shohei Otani. Otani's Japanese club, the Nippon Ham Fighters, announced Friday that they will allow the 23-year-old to be posted and made available to major league teams this offseason. What makes Otani particularly valuable is that he's both an ace right-handed pitcher and a power-hitting left-handed outfielder. Think of Otani as a combination of Yu Darvish and Hideki Matsui. What would a major league club have to offer to acquire a player like Otani, who is essentially two-for-one package? In this case, not much. Since the two-way star is just 23-years-old, he is restricted by Major League Baseball's international signing rules which limits most teams to a bonus pool of $4.75 million in which to sign international free agents under the age of 25. So what does this mean for the New York Yankees and New York Mets and their chances of acquiring the Japanese phenom? On the surface, Otani is exactly the type of player the Mets need. The two-way star would not only add depth to the team's injury-riddled starting rotation, he would also provide a potent bat to help fill some of the offensive holes created by the absence of Jay Bruce, Curtis Granderson, Lucas Duda and Neil Walker. It's clear after a disappointing 2017 season, the Mets are looking to rebuild and Otani could help jump start that process by joining a pair of promising young players, Amed Rosario and Dominic Smith, to create a fresh nucleus of talent. Wouldn't it be something if the Mets were able to best their crosstown rivals, the Yankees, and land the next great Japanese star? The problem is, while the Mets are prepared to spend on the traditional free agent market this offseason, they have already exhausted most of their bonus pool money on the international market. Otani would certainly be an attractive piece for the Mets, but the likelihood of the team bringing him to Queens is close to none due to international signing restrictions. On the other hand, Otani works for the Yankees for a number of reasons. The Yankees can offer the second-highest bonus to Otani, at $3.25 million, just behind the Texas Rangers, $3.535 million, which puts them above nearly all of the teams in heavy pursuit of Otani. Even if the Yankees deplete their international resources to sign Otani, the 23-year-old is a bargain and would help New York get beneath the $197 million luxury-tax threshold in 2018. On the field, Otani would help the Yankees fill out the rest of their rotation and could potentially serve as a part-time designated hitter and outfielder on days when he is not pitching. Imagine Otani blanking hitters every fifth day and then aiming for the short porch in right-field the other four. The Yankees are front runners, if not the favorite, to land Otani this offseason. The Yankees have the money, the lucrative endorsement possibilities and a fellow Japanese-born player in Masahiro Tanaka to help ease Otani's transition to the states. Who better to continue the legacy of Matsui and Tanaka than a player like Otani who could become as good as both of them? The Japanese version of Babe Ruth is ready for the majors, and his next destination could very well be the Bronx.